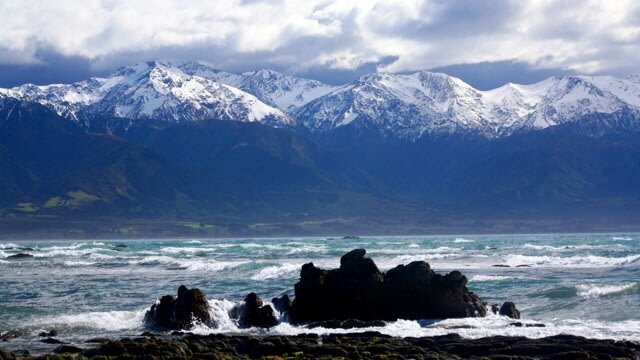 Kaikoura, where mountains drop down to aquamarine waters and whales dwell in the deep blue depths. Considered a favourite stop by many of our Driver Guides, Kaikoura’s unique landscapes and wildlife are something not to be missed. 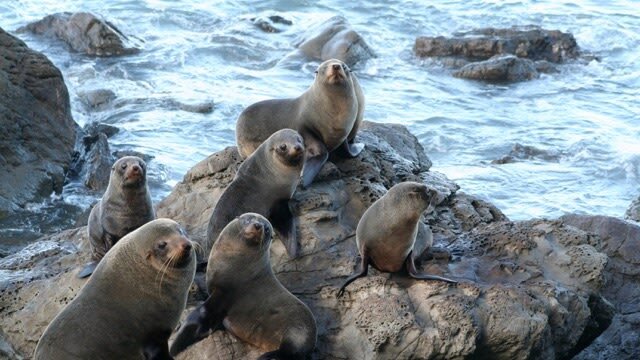 If sea creatures have you thinking seafood, look no further than Kaikoura’s name. In Maori kai means food and koura - crayfish (lobster); you won’t have any trouble hunting down the town’s namesake ‘meal of crayfish’ or seafood of the crispy battered kind. This spectacular spot was hit by a 7.8 magnitude earthquake in November 2016, closing the main roads in and out of Kaikoura for a fair few months. Passenger safety is always our top priority and we believe that it is time for us to return to New Zealand’s Marine Hot Spot. 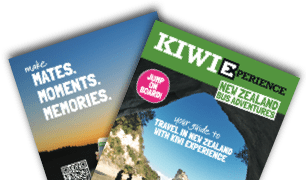 Too excited about getting this South Island favourite back on our bus route, we’ve lined up our best Kaikoura travel tips. 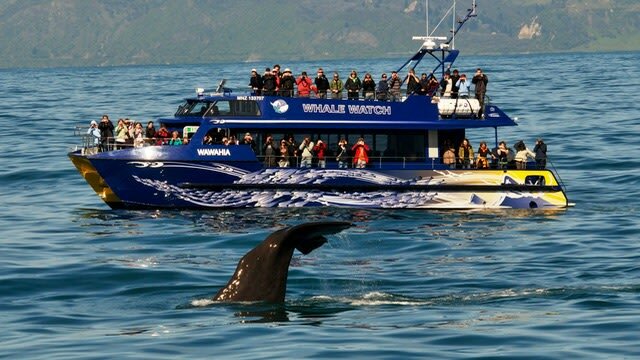 Kaikoura has always been the place to see whales in New Zealand. Marine life here is second to none thanks to the incredibly deep Kaikoura Canyon. Not far from the coast, this underwater canyon drops down over a massive 1200m. The cold water currents bring up tasty nutrients from the depths, attracting everyone in the food chain - from plankton, right up to the resident sperm whales and dusky dolphins. It’s not only the ocean’s treasures that make Kaikoura so special. The snow-capped Seaward Kaikoura Range towers behind the coast - epic mountain views combine with this relaxed town for a unique, chilled out vibe. No surprises here, topping the to-do list in Kaikoura it’s all about the ocean. Eco-tourism is strong in Kaikoura and sea life in these parts has always been 100% wild. All tour operators are super careful about minimizing their impact on the animals and the environment. One of the few places in the world where you’ll find sperm whales hanging out year-round so close to land, Whale Watch Kaikoura has a 95% hit rate for whale sightings on their trips. It can get a bit choppy out at sea, but any seasickness is quickly forgotten once you’re in range of these magnificent mammals. With a massive lung capacity and a huge appetite to match, sperm whales can spend 40-60 minutes underwater at a time, hunting down squid and other fishy prey on the sea floor. They come back up to surface for a short period before diving back down, which is where the speedy Whale Watch boats come in. They’ve got tracking whales down to a fine art, zipping over at high speed to get you up close and personal during the whale’s surface time, without disturbing the giant beauties. Making it extra special is the team's intimate knowledge of the resident whales - each one has it's own name and background story. Strike it right to snap the money shot - their famous tail flick with the mountains behind. Humpback whales also grace these shores, most often seen from June to August. 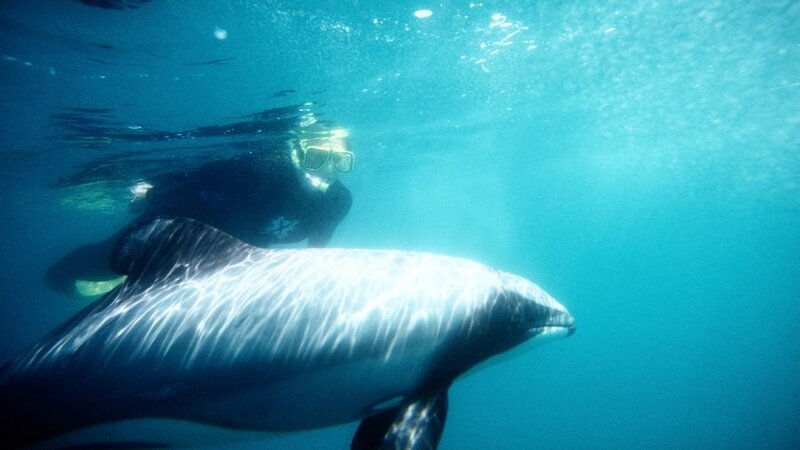 If swimming with fun-loving dolphins is on the bucket list, get your wetsuit on pronto with Dolphin Encounter Kaikoura. Like their larger whale friends, the Dusky Dolphins are year-round residents of Kaikoura’s waters. There’s no flying-solo for these guys, they’re a super social species cruising in pods of 100 to 1000 dolphins - which also helps with Dolphin Encounter’s second to none viewing success rate. Once wet-suited and ready to brave Kaikoura’s cool waters, the Dolphin Encounter team will get you out on their boat in and amongst the action. If you’re lucky you’ll be one of the stoked swimmers that comes away with tales of playing underwater tag with these inquisitive charmers. Try getting on a dawn trip - this is when the dolphins are usually most active. The Kaikoura Peninsular Walkway is one of the best walks in the area, delivering a great view-to-effort ratio, whether you’re up for a quick jaunt, or the full 3-4 hour track right around the peninsula. Pass the Point Kean car park and its sunbathing seals, then head onwards for panoramic views of the Kaikoura Seaward Range, rugged clifftop paths and native bird colonies. Whether it’s the town’s prized crayfish or fresh fish in golden batter, Kaikoura is all about the seafood. Crayfish isn’t a budget-friendly meal but its deliciousness is well worth splashing out for. 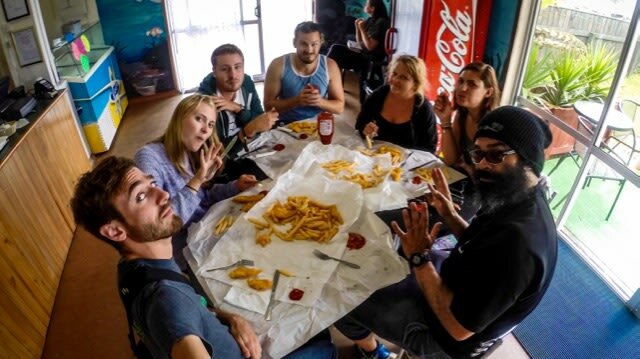 For cheap eats you can’t beat fish and chips in Kaikoura - $10 is usually enough for all the noms you need. The night-life is tranquil, but there’s a couple of pubs along the main street. Mountain views and a cosy fireplace seal the deal at the Lazy Shag. This spacious hostel has a great common room (with aforementioned fireplace), a well-equipped kitchen and comfy sofas to curl up on. Strike it on a sunny day and you’ll be able to make the most of the sizeable balcony (complete with mountain views) or stroll across the road to the beach. A well-placed hostel with a homely vibe and decent outdoor area, staying at Top Spot means you’re within a few minutes walk of Kaikoura’s town centre. The upstairs balcony gets you great sea views and the rooms are simple but comfortable. 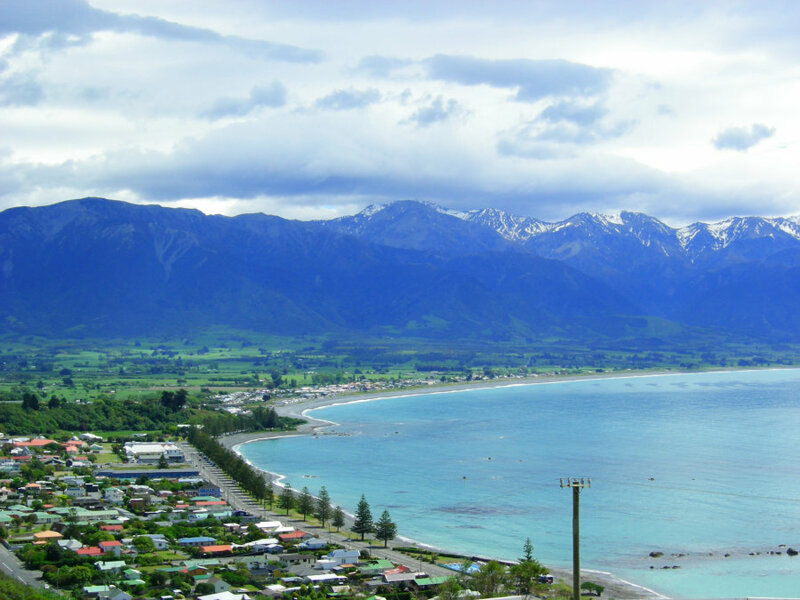 For a whole different (spectacular) view of Kaikoura and the surrounding area, head up to the 1600m peak of Mount Fyffe. The track starts 15km from Kaikoura, heading inland from the coast through the more alpine terrain. It’s an 8-hour return walk so bring energy to burn. If the weather’s on your side you’ll be rewarded with views that can stretch as far as the North Island and the Banks Peninsula to the south. If you’re feeling fancy, head north for some wine tasting in the sun-soaked Marlborough region. A couple of hours from Kaikoura, this is New Zealand’s biggest wine region - a massive 75% of our wine is produced here. With 120 vineyards, vino sampling opportunities abound. Added bonus, the area gets more than its fair share of sunshine hours and many vineyards have awesome coastal views. If you’re Picton-bound for the ferry it’s an easy stop off en-route.